Norfolk has many associations with the paranormal, from ancient tales of Shuck the hound that has haunted the county's lanes for a thousand years to tales of ghosts from the Second World War and of unidentified f lying objects. This book takes a new approach by looking at the paranormal as recorded in the archives of the county. The stories include those collected by some of the county's keenest folklorists such as W. H. Cooke, Mark Taylor, and W. G. Clarke, as well as first-hand records of paranormal experience. Many tales are published for the very first time, such as Mottie Green, the Wells 'witch', and a new light is thrown on more familiar stories such as the haunting of Syderstone Parsonage and the Snettisham ghost. 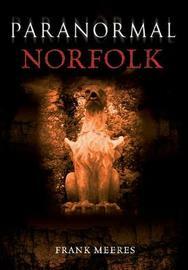 Not least, the book also explains the key role of Norwich in the development of the vampire story! Read this book and your view of Norfolk will never be the same again!